For those of you who have bought our morning glory tea before, this is the same great blend except we’ve added even more tea to our temple. 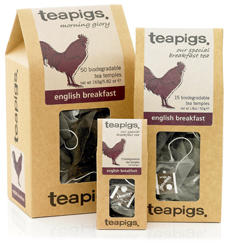 We renamed it english breakfast as some people didn’t recognise that this is our everyday blend of tea. Our signature blend – the teapigs version of builders’ tea, if you will. Far from ordinary, it’s a skilful balancing act between three glorious teas: a gutsy Assam, a mellow little Ceylon and a powerful newcomer from Rwanda. We’ve picked the very finest tea estates for this blend and worked with the owners to make sure every cup of english breakfast is perfect. We love all our teas but we can’t start the day without a cup of our morning glory, particularly on a Monday. Compare the large leaf in our tea temples to the dust in your regular tea bag; whole leaf is best. A gutsy tea. A perfectly balanced blend with a malty, zesty, rich strength. With milk. Add sugar if hungover. Anything ranging from slightly sluggish to utterly grizzly. If you’re in a brilliant mood, it will make you feel even better – hurrah. Black tea-a gusty Assam, a mellow Ceylon and a powerful Rwandan newcomer.